Cats can get colds with coughing and sneezing. 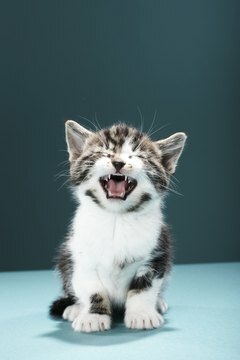 Isn't it cute when your kitten sneezes? That cough seems a bit off, though. Come to think of it, he's sneezing and coughing an awful lot. Is he sick? Indeed, cats can get colds with coughing and sneezing. Sometimes these symptoms mean something more, though. See a vet. The first couple of times your kitten coughs or sneezes, it's probably cute. Make a YouTube video. Start the latest, greatest Internet meme. If your kitten keeps coughing and sneezing, though, see a vet. Because their immune systems aren't fully developed, kittens are more susceptible to germs and infections than healthy adult cats.If you're lucky, your cat just has the flu, but he could have something worse. Kittens can acquire several bugs, including feline herpesvirus, that affect them for the rest of their lives. A seemingly innocuous cough and sneeze may even be the first sign of a life-threatening illness. If your kitten's coughing and sneezing enough that you're concerned, the most likely culprit is an upper respiratory infection, which is basically a kitty cat cold. Two viruses, feline herpesvirus and calcivirus, are responsible for the majority of these. Symptoms may appear mild and treatments range from rest to antibiotics, but the associated risk of pneumonia makes the cat flu a potentially serious condition. Most cats fully recover from either viral infection, though. Sneezing is usually more pronounced than coughing, unless you're dealing with a lower respiratory infection, and that can be much more serious. The issue is that coughing and sneezing are natural reactions to just about anything that goes wrong inside a cat's nose, mouth, throat and lungs. Absent a respiratory infection, kittens who come from shelters or areas with lots of cats are more likely to contract chlamydophila felis bacteria or bordetella bronchiseptica (aka kennel cough). Coughing or sneezing can also indicate feline infectious peritonitis, feline immunodeficiency virus, feline leukemia, mycoplasma, acute or chronic bronchitis, feline asthma, cardiomyopathy, heartworms, lungworms and numerous viral, bacterial and fungal infections. It may seem counterintuitive, but vaccinating your kitten can make him sick. Sneezing, in particular, is common a few days to a week after any intranasal vaccine, but usually clears up on its own. Pay attention to when your cat coughs and sneezes. He may be allergic to smoke, perfume, dust, cleaning fluids, pollen, mold or even his food. Allergies cause lots of symptoms that look like a cold. If you can't address the source of these irritants, try an air filter. If your kitten has a condition that makes him cough or sneeze, try using a vaporizer to ease the stress on his nasal passage. Many human cough and sneeze relief medicines contain chemicals harmful to cats. Ask your vet which ones, if any, are cat-safe.